Gramory is a client app for iPhone that improves the interface, but maintains the vibe of Instagram. Gramory offers an extremely successful platform for exploring your photography, your friends’ photography, and the Instagram social networking community’s shared photographs. Gramory’s iPhone app adds some successful tools from Facebook’s mobile platform to enhance navigation of Instagram’s rich content. With one touch, a vertical menu to navigate between the default popular photos screen and other feeds and tools appears in the left side of the screen. With one touch, the menu closes. If you decide to search through trends and topics, the options lengthen to explore them. If you want to fiddle about with your account, search for your friends, and check out your news feed, then those options expand when you touch your account name in the menu bar. Gramory removes the Pinterest-like news feed with the bold, large, highlighted photo and options for commenting and liking. It is replaced with a grid of thumbnails. Visually, it’s stunning, and, in many ways, it has much more impact and strength. 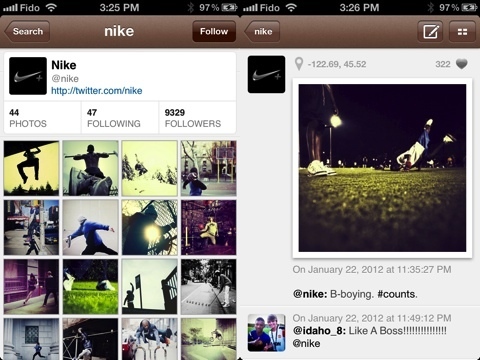 It’s a full screen of tricked-out Instagram photos that appear quickly as you scroll down your screen. The developers at Bedroom Code have clearly dedicated attention to the technical details ensuring the quick delivery and agile response required by a photography iPhone app. By choosing to use thumbnails, the load time is decreased and virtually unnoticed. This is not necessarily the case with all photography and rich content iPhone apps. The choice to use thumbnails also increases user engagement. There is an excitement and energy in the increased number of photos available at one time. When you touch a picture in the Gramory client for Instagram, Bedroom Code also incorporated some enhanced features. You find the Instagram user and profile picture in the top left. The action items are in the top right corner. To comment, you press the icon. The photo then slides down, and a comment box and keyboard appear. This is smooth and successful interface. Also at the top right corner is a list icon. When you touch it, the selected photo shifts to the left and a feed of the user’s photos appears in the right. You can scroll through and check out other photos without shifting between different screens. Gramory’s client application for Instagram adds intuitive accessibility to this popular photography and social networking iPhone app. It has a fresh, clean feel, as well as a level of sophistication in its interface and navigation that sets it apart. Gramory brings more to Instagram than you would expect from its free price tag. Highly recommended. 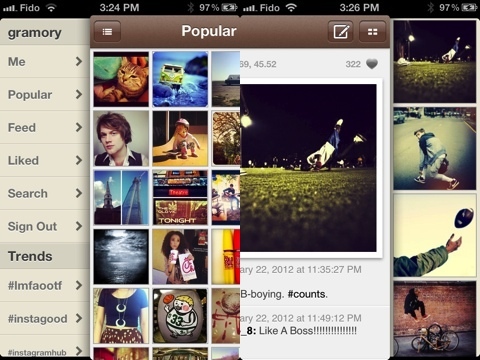 AppSafari review of Gramory was written by Jenni Ward on March 14th, 2012 and categorized under App Store, Featured, Free, Photos, Social. Page viewed 5537 times, 2 so far today. Need help on using these apps? Please read the Help Page.